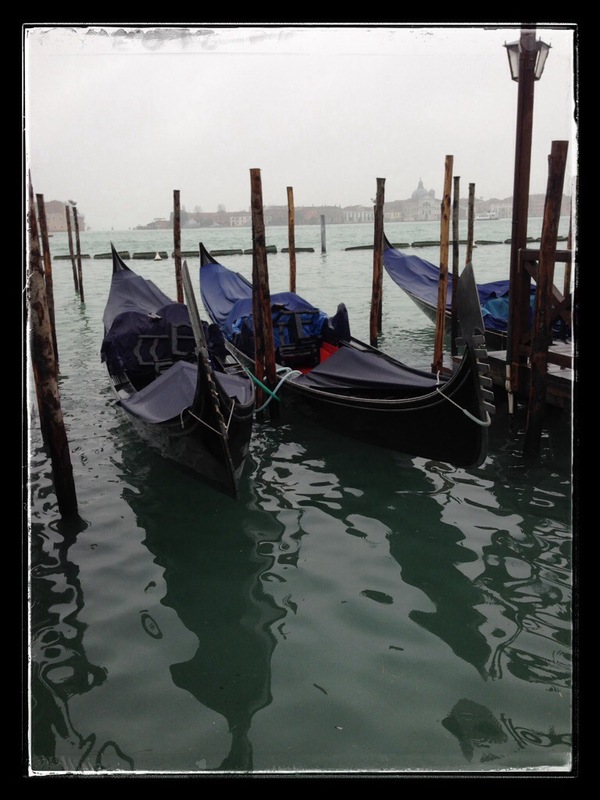 pairs | Interior Images Ltd.
Venice is a city in many ways untouched by time. The stately buildings and jade-green canals stared passively as Charles Dickens planned a stop for his little Amy Dorrit, as Gaston Leroux gathered inspiration for his enigmatical Fantome, as Mark Twain took them in during his rollicking world tour, and as Mary, Eric, and Jonas Reyes strolled around, absolutely agog, just a week ago. 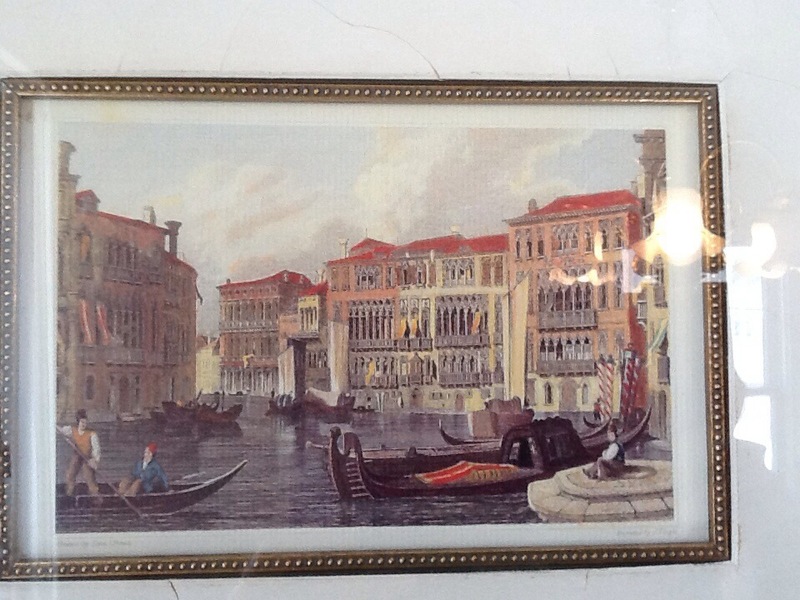 This picture taken by Mary would have fitted in the albums of any one of her foregoers..
How would it be if you could have a snippet of Venice in your own home, with more visual identity than a simple photograph? 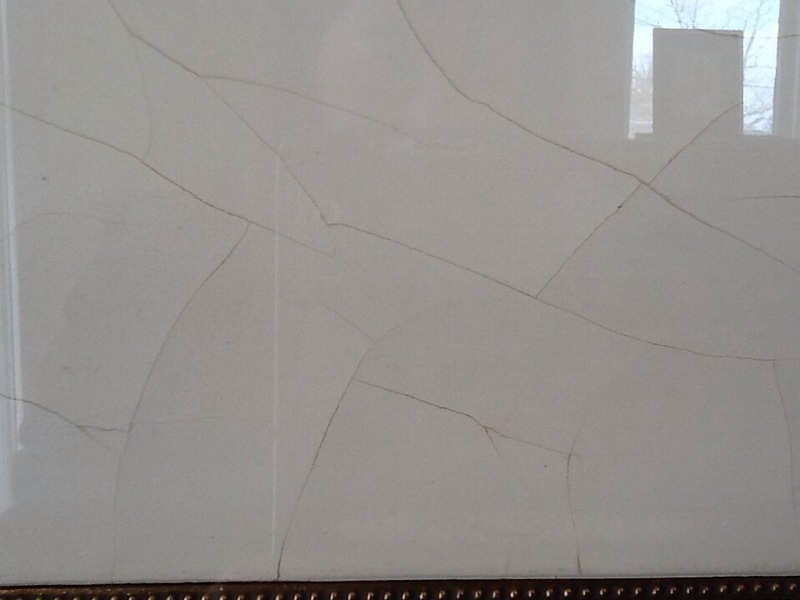 How would you like to have on your walls something so Venetian, people will think you chiseled it off a wall there? You’d love it, of course. 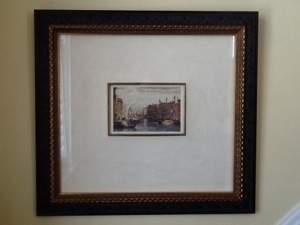 The John Richards company has just that – embodied in a pair of fascinatingly framed lithographic scenes of old Venice. Each scene is has been painstakingly hand-colored and surrounded generously by a gold beaded insert and a mat of cracked gesso (a plaster-of-Paris compound) to make the picture feel at home. 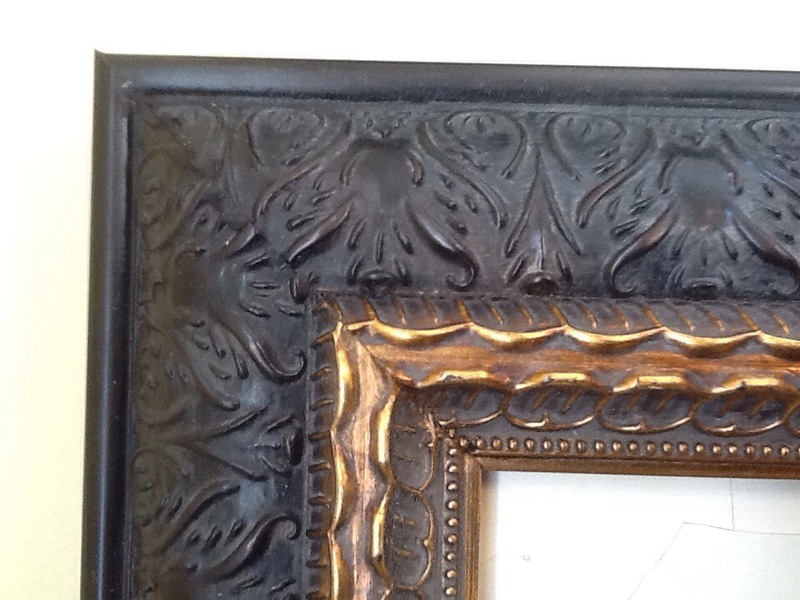 The gesso, in turn, is glassed and framed by ornate black and gold. 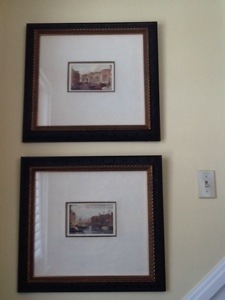 I can assure you that the frames are very well made, and the art object en masse is very heavy. The collection is named Barbarigo, after Signore Agostino Barbarigo, the late Doge of 15th century Venice. 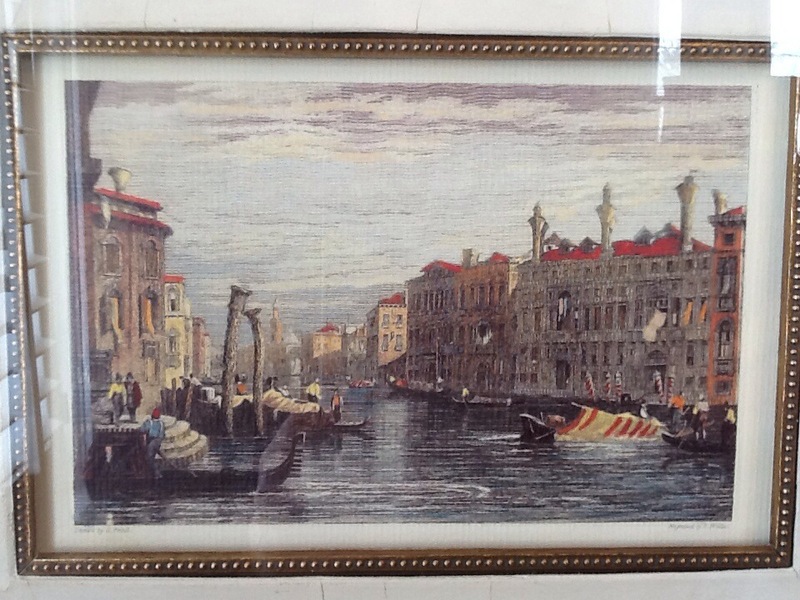 Make a connection with your inner gondolier and see the prices at Interior Images! Artwork can do much to add life and character to a room. This pair of paintings, provided by the Paul Robinson Company, would be a warming addition to a morning room or living area. 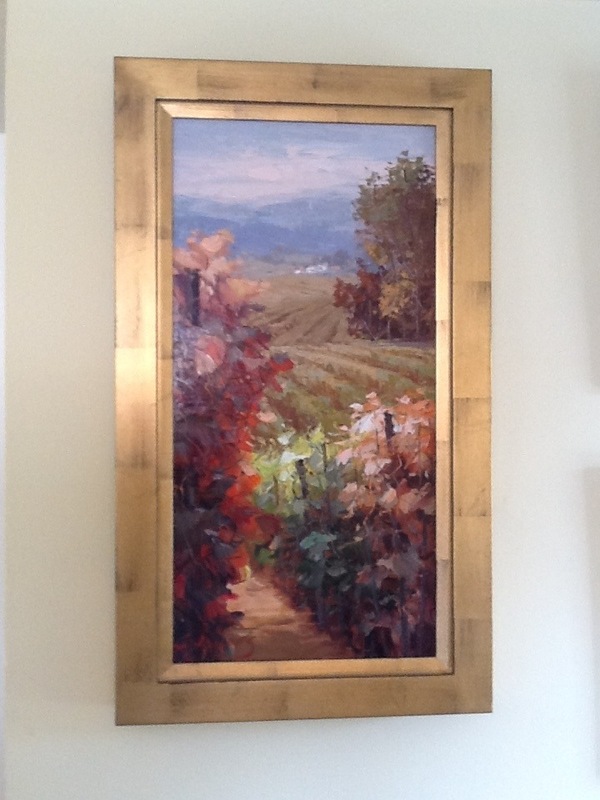 The two portray impressionistic vineyard scenes with deep, warm tones and bold strokes. The large, gold frames of basic lines enable the artwork to be used in contemporary or traditional settings. The frames lend a great deal of visual mass, and measure on the outside 16 1/2″ x 28 1/2″. The canvas itself measures 12″ x 24″. The detail above shows the small village in the distant background of the painting. The original retail price for each painting is $730. However, for those of you who are interested, we would be willing to part with the pair for $1,000; or a single painting for $630. Interior Images carries several Paul Robinson Co. paintings, drop in and see them for yourself!